So as a follow on from my last blog post on metallic shoes (see here) it seemed only right that I do a post on metallic bags as after all new shoes need a new partner in crime no?!!! Plus of course it's a great little purchase that can be used all year round & like metallic shoes will go with everything in your wardrobe. Now I may have slipped a little Boden cross body bag/clutch into my shopping basket the other week when hubby was snoozing on the sofa.....well what he doesn't know won't hurt him & I've already rehearsed the 'what this old thing' line for when he spies it (hubby if you're reading this - when have you EVER heard me say that?!!! ;-) ). Now unfortunately I'm unable to add the link to said new purchase as it was a sale item, which is a HUGE plus for me as it was reduced to a less eye watering amount of £34.50, which for a leather Boden bag I think you'll agree is a great result :-) Although I have to admit to being a little unsure when I hit the buy me button as despite being the exact style I was looking for - plain, simple, cross body which can be made into a clutch, instead of being a subtle shade of gold it's full on bling-tastic. But seeing as I managed to snag a free delivery & returns code I reckoned there was nothing to loose & I'm thinking you can go big on the bling if teamed with a simple outfit such as distressed jeans & white shirt. Now although my Boden purchase is no longer available fear not there are still some gorgeous bling-tastic bags around, although if I'm honest not as many as I would have thought but I suppose there should be more coming into stock as the temperatures increase which means more research *coughs shopping* at a later date, naturally!!! 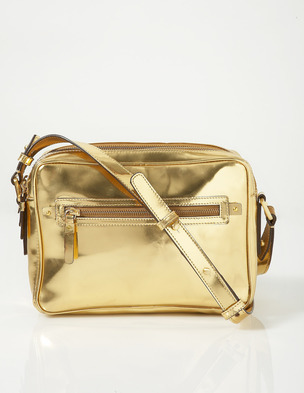 So having snagged a bargain at Boden you'll be pleased to hear they've also got a gold bag in their spring collection too but be warned this is not for the faint hearted & ranks high on the bling-o-meter. My sales purchase is slightly but not quite as bling-tastic as this but not far off! 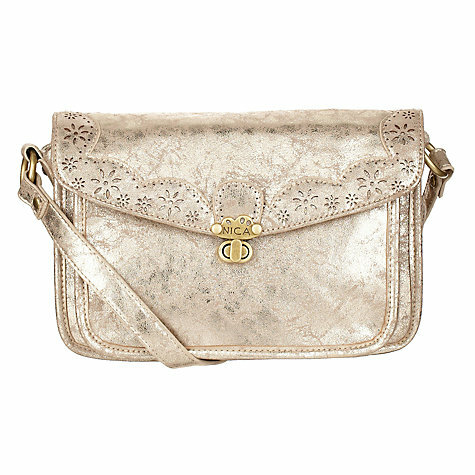 Next up is this gorgeous cross body leather bag from Owen Barry. I love the pony skin detailing on the flap & how the gold has been toned down by the addition of the brown strap. This bag would look so cool teamed with some distressed boyfriend jeans, a blazer & some pumps for a really stylish laid back weekend look. Now this next bag from Nica Alicia was more the shade of gold that I had in mind when I started my search, which in my mind is more of a distressed shade of gold. I love the simplicity of the design of this bag although I can't quite decide if I like the cut out detailing around the edge of the flap. Although without it there is the possibility that the bag could look too plain?! I also love this next bag from Oasis, a gorgeous shade of gold & cross body too, perfect for a night out or when on your summer hols & you need a little evening bag to pop the essentials into. Moving away from cross body bags & onto clutch bags, which I seem to have developed a HUGE weakness for in recent months & this River Island asymmetric is getting my heart all a flutter. I just love the simplicity of the design not to mention the aged gold, slouchy look it has - pure perfection. For something a little more structured in design then you won't go wrong with this gorgeous cuff designed clutch from Next. Stepping away from gold clutches & onto silver (which seem to be even rarer than gold) & this envelope purse from ASOS is everything you will need from a clutch, being both simple & elegant in design. Now another style metallic bag that I find myself longing for is a 'throw everything in, including the kitchen sink' kind of style. 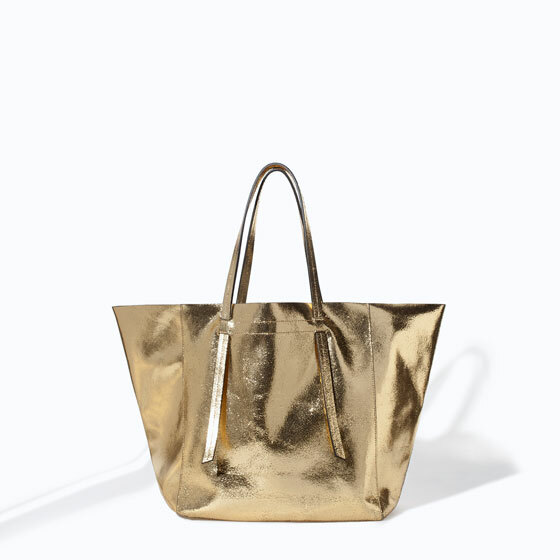 You know the kind of bag that on days out as a family when you need a bag that everyone's sunnies, coats, camera, refreshments etc, etc can be chucked into but still feels stylish enough to hold & I don't think you could go wrong with a metallic shopper style. Plus of course I think it would make the idea beach bag for hotter climates, although you may have to persuade your other half that it really won't affect their masculinity when walking to the beach to be seen with something with a bit of bling as opposed to something a little bit more neutral ;-) Now for the money then you can't go wrong with this silver number from ASOS. 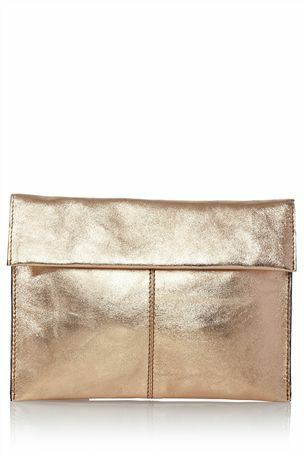 Or if gold is your preference then this crackled leather one from Zara also looks stunning. Or what about this shorter handled design from Boden? So there you have it, what do you think? Are you considering going down the metallic route this spring/summer? If so are you going for silver or gold or maybe you're going to be throwing caution to the wind & getting both? Finally here's a quick round up of what I've been wearing since my last post. So there you have it the best selection (in my mind anyway!) 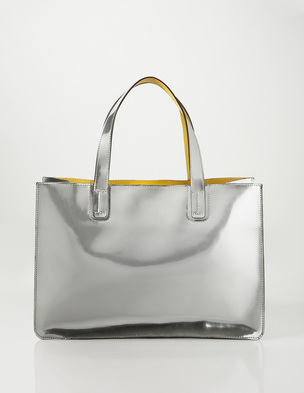 of metallic bags that are currently available. Of course seeing as there wasn't quite as much choice as I would have liked I reserve the right to research this topic again at a later date & maybe, just maybe make an additional purchase or two.....well surely if you need a gold bag your must need a silver bag too....right??!!! I'd love to hear if you'll be joining me on rocking a bit of bling this spring & summer & if so which style you're looking for & what you plan to wear with yours. Have a great few days & see you in a couple of days. Thanks Michelle, I'm feeling more of a pull to gold at the moment but give it time!! Gold not good! It never lets me go back and edit! 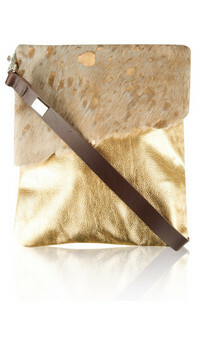 Ooh loving the sound of the muted gold snakeskin clutch Lynne I bet it looks fab! my going out bag has always been metallic, goes with everything and strangely blends without being too look at me despite all the shininess, glad that it is finally in fashion! My sister is bling crazy, she's going to embrace this trend full on!! I am not sure I'd use a metallic bag for day, but I could definitely see a gold one going well, like Alexandra said, with everything, for evening. Well done on the bargain bag! It's a gorgeous bag isn't it Donna, something that little bit different & perfect for teaming with a simple outfit. Good luck with the hunt of the clutch! Thanks Emma, I absolutely love the pony skin on the Owen Barry bag, something just that little bit different isn't it. Ooh those sound gorgeous Helen....I may just have to check those out! !